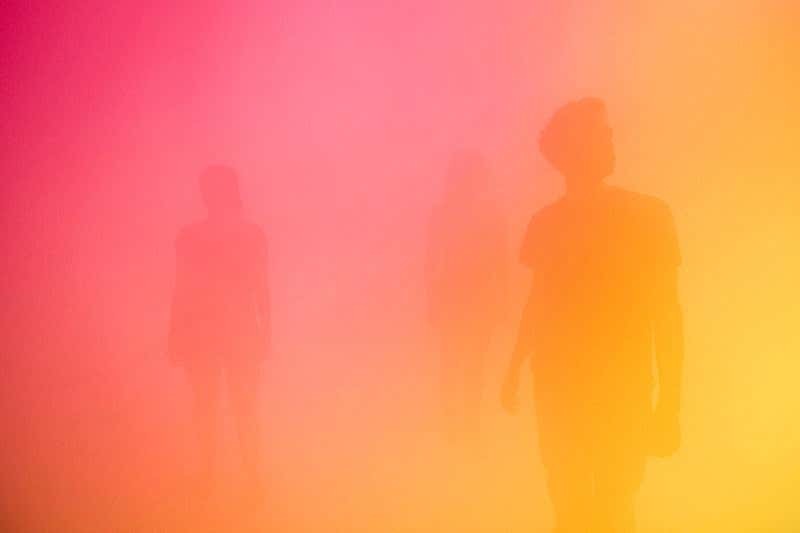 Three bands of light – one pink, one yellow, one blue – illumine the obliterating smog that artist Ann Veronica Janssens has used to fill the Wellcome Collection’s first-floor gallery. This white-floored, white-walled, white-ceilinged room is trying very hard to disappear. There’s no directionality to the light here, so there is no sense of up or down. Your first sensation is not so much of falling as of leaning, or rather, of being leant, like a roll of carpet propped against a wall. This sensation, that you are suddenly operating out of kilter with the real geometry of the world, does not go away. I’m not alone in here. The other explorers are just about visible as they come within braking distance of me. The walls are another matter. The light reflected off the smog and the light reflected off the walls are indistinguishable. The walls may as well be made of glass for all that you can see them. Hitting one, I turn and move forward, running a finger along the hard surface to keep my orientation – and promptly bump my nose on another wall. All the time I’ve been thinking I’m staring into the void, I’ve actually been staring into a corner. I turn around to face into the room. At least, I think I do. The room is a rainbow of mist. You step through an airlock arrangement into pink mist. If you walk straight ahead you will shortly pass through a yellow murk and into a blue cloud. Those loose synonyms – mist, murk and cloud – aren’t just there to get what might have been a repetitive sentence past the subeditor. They have significance. The pink zone is a true smog, the one that most obviously messes with your perceptions. It feels profoundly, viscerally wrong – faux psychoanalytical explanations of being trapped in a womb seem irresistible. The pink zone robs me of things to see, and also of the actual sensation of seeing. I am made painfully aware of the floaters scudding over my eyeball. It’s probably best to avoid this show when you’re recovering from the night before. The yellow middle zone is a queasy, transitional space, that seems to shift depending on whether I approach it from the blue end of the room or the pink end. I find it hard to stop here. In the blue zone, in contrast to the pink zone, it is virtually impossible for me to imagine that I cannot see. There’s still nothing around me, but the nothing feels familiar and natural. I’m walking on air. What could possibly go wrong? As I think this, I stub my toe: another wall.